The provincial government is seeking public input on the proposed expansion and reclassification of southeastern Alberta’s Twin River Heritage Rangeland Natural Area (HRNA). This is an important chance to support protection for this critical grassland habitat and to raise concerns over ongoing threats encroaching on this landscape from oil and gas exploration. AWA believes that, in order to protect Twin River’s critical grasslands and wildlife, the Government of Alberta must reconsider the outstanding mineral leases, including wellsite and pipeline applications by Granite Oil Corp. that will be submitted in the near future. Your voice will help these critical grasslands get the protection they deserve! The deadline to comment is Friday, August 31. You can read about the proposal here, and take the government survey here. 1. Support for reclassification – ‘Heritage Rangeland’ is a stronger designation than ‘Natural Area’ for protecting endangered grassland ecosystems. 2. Support for expansion – expansion of the protected area is an outstanding opportunity to protect grasslands that have yet to be industrialized, and further their conservation through responsible grazing. 3. Oil and gas development is completely inappropriate within this critical grassland habitat. As such, the Alberta government should cancel Granite Oil Corp.’s leases, with fair compensation. 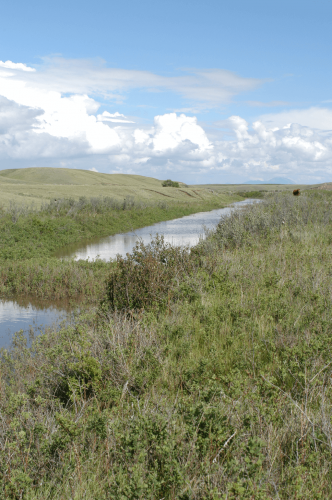 Twin River Heritage Rangeland Natural Area is one of the remaining blocks of intact native grassland in Alberta. While native grasslands only cover roughly five percent of Alberta’s land base, they support almost half of the rare ecological communities, 40 percent of rare vascular plant species, and 70 percent of mammal, bird, reptile and amphibian species considered ‘at risk’ or ‘may be at risk’ in Alberta. While grasslands hold such rich biodiversity, they are one of the least protected Natural Regions in the province, currently less than 2 percent protected. You can learn more about the Heritage Rangeland and Natural Area designations from the Government of Alberta’s comparison, and how Heritage Rangelands can offer better recognition and legislative protection for Alberta’s Grasslands Natural Region.